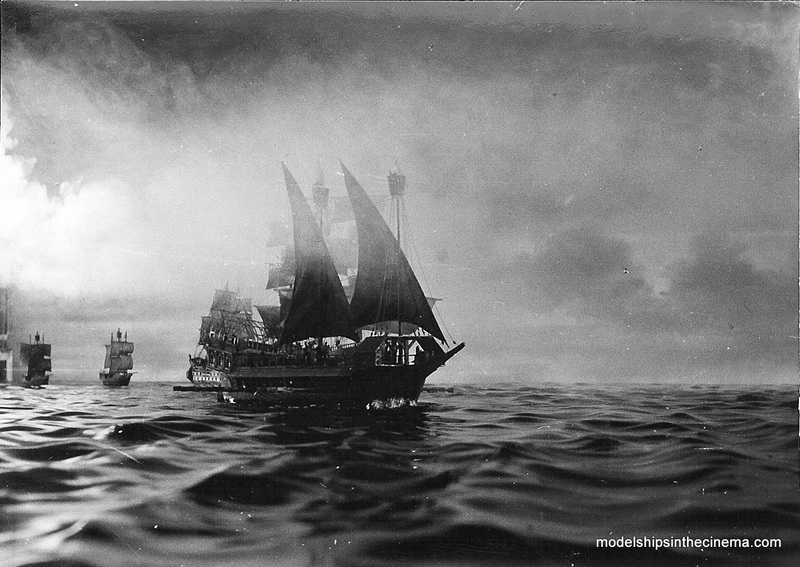 In August 2014 I acquired a photograph of three model ships with a floating smoke ring . I had no idea what the title of the film this photo was taken from. I did know that the DEFA logo, which is in the bottom right corner of the picture, is the acronym for Deutsche Film-Aktiengesellschaft, which was the state-owned film studio in the German Democratic Republic or East Germany before the fall of the Berlin wall. I asked at the time if any reader knew any information about the subject depicted as I was be very curious to know. Thanks to the detective work of readers Mathias and Ronald P, the photo was found to be from the 1962 DEFA film, Die Schwarze Galeere (The Black Galley). I subsequently managed to acquire three more photographs from the same film. 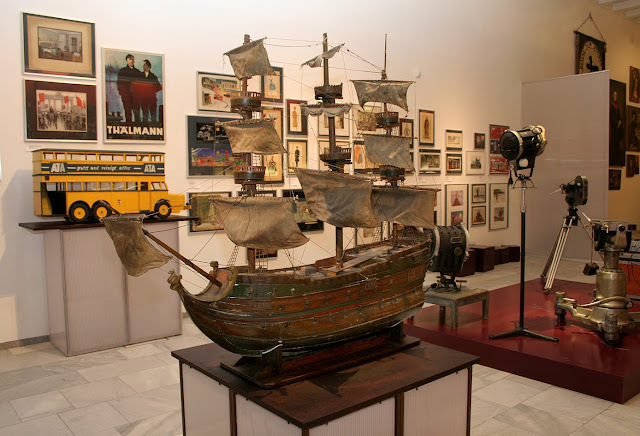 As reported by Ronald P one of the models from the film is on display at the Film Museum Potsdam. 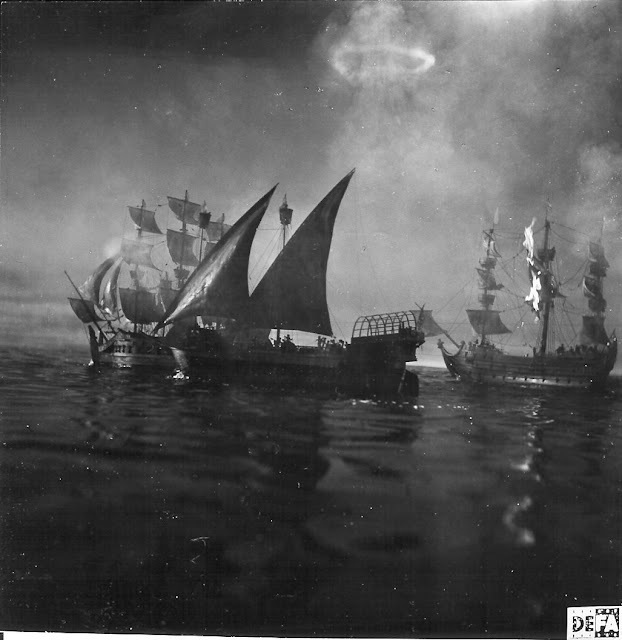 It's a screenshot from the adventure movie "The Black Galley". 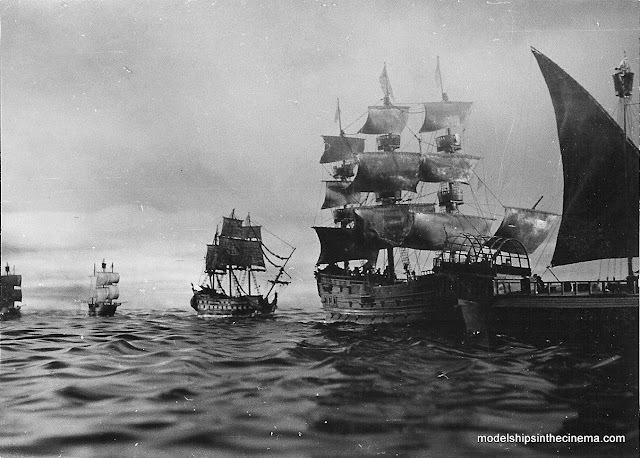 The film was made in 1961 or 1962 and it's the onliest DEFA-film with a model ship sea battle in there. I don't like that film because it's a very poor and cheap made flick with bad model ships, bad costumes and poor acting performances. I've bought the dvd a couple of years ago and i was highly pissed off. I did a bit of digging, and may have a lead; the 1962 DEFA film, Die Schwarze Galeere (The Black Galley). 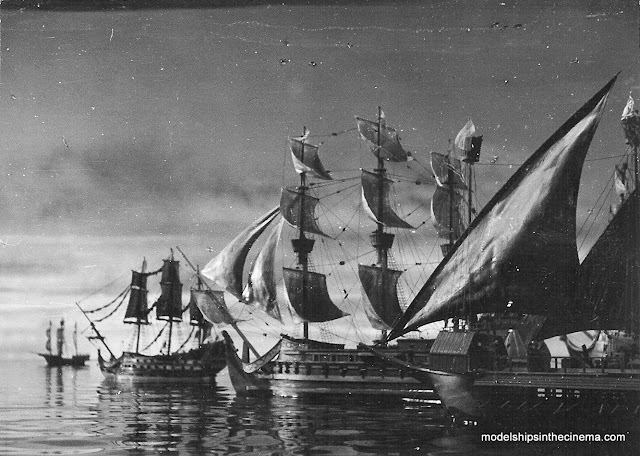 There is a photograph of a model at the Filmmuseum Potsdam website that closely resembles the galleon on the right of your photo. Note the wyvern figurehead, and the rather odd rigging. Anyways, thanks for a great blog. See you at the movies. I may have found a lead to your mystery film; DEFA produced a film called Die schwarze Galeere (The Black Galley) in 1962. A Google image search for the original German title returns a picture of one of the models (the galleon on the right of your photo). Evidently the model still exists in the collections of the Filmmuseum Potsdam. There is also an IMDB entry for Die schwarze Galeere, but no additional images. As a german I feel ashamed for that film because "Die schwarze Galeere" / "The Black Galley" is one of the worst swashbuckler-period flicks that I have ever seen. It is a first class example for bad miniature shots and loveless filmmaking. You really could call it an "ARTISTIC ACCIDENT". Nevertheless, the former GDR Production Company DEFA also released a lot of high quality made history- and period films as well as several very well made TV-Series with historical themes.